“Listen—Travis Coates was alive once and then he wasn’t. “The in between part is still a little fuzzy, but Travis can tell you that, at some point or another, his head got chopped off and shoved into a freezer in Denver, Colorado. Five years later, it was reattached to some other guy’s body, and well, here he is.”–From publisher’s description. John Corey Whaley is coming to the Ontario City Library Teen Book Fest on May 16, 2014. I’m enjoying his novel Where Things Come Back and will review it as soon as I finish. 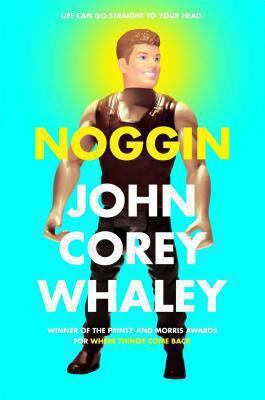 But in the meantime, why don’t you check out this MTV interview with Whaley about his new book Noggin, due for release on April 8. The MTV interview has a great book trailer as well. This entry was posted in Family Problems, Fiction, Romance, Sci-Fi/Futuristic, Young Adult Literature and tagged book reviews, book trailer, John Corey Whaley, MTV book trailer, Noggin, Ontario Teen Book Fest, YA fiction, YA literature. Bookmark the permalink.